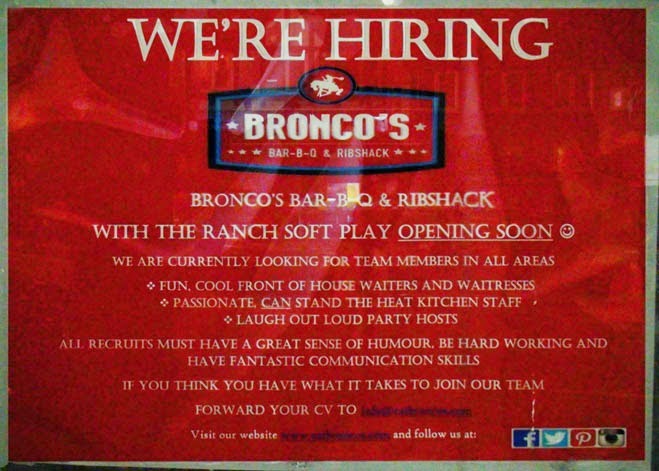 "We are about 4 weeks away from opening and are now looking for local team members for Bronco's, please let Worcester Park know that we are recruiting for:Waiters, waitresses, children's party hosts, soft play team members, kitchen staff including chefs & porters. Please send CVs to info@eatbroncos.com." I've been a bit busy this week so haven't been able to post much, so this would now mean they are about 3 weeks away from opening. Probably throwing open the doors mid to late November. So if you are local person looking for a job - here is good opportunity! As I have banged on about supporting local business before - here is a perfect example of why we should. Local businesses employ local people. The more successful they are, the more jobs are available for local people to do. Worcester Park prospers by having both more choices available and more people in employment. Everybody wins!